No fewer than three persons have been confirmed dead and six others injured following a rainstorm at Maibare in Baure Local Council of Katsina State.The incident, which occurred at the weekend, destroyed over 700 homes in Maibare, while farmers lost several farmlands and animals to the natural disaster. Similarly, rainstorm destroyed 180 houses and rendered over 100 families homeless in eight communities in Kurfi Local Council of the state. 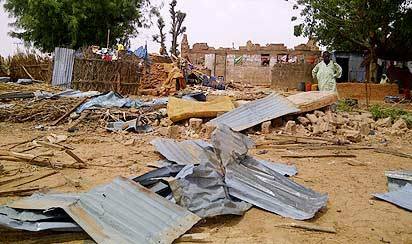 The affected communities are, Sabon-Unguwa, Wurma, Kofar Yamma, Birchi, Tsauri, Nasarawa, Kofar Fada and Kofar Ruwa. In both incidents, the rain started at midnight and continued until noon the following day.The Guardian learnt that riverbanks in the affected communities had overflowed their banks, with several farmlands washed away in the waters. Also, hundreds of domestic animals including chickens and goats were drowned or washed away in the flood.Over six council areas including Bakori, Dutsinma, Kankia and Jibia, have so far been affected by heavy rainfall this year, with attendant destruction of houses, farmlands, animals and other property. A similar rainstorm had recently killed over 40 people and destroyed over 500 housese in Jibia. Governor Aminu Bello Masari, who visited Jibia and Baure to assess the situation and condole with the people, urged people to avoid building houses on waterways and blocking drainages.He, however, directed the State Environmental Management Agency (SEMA) to assist the victims with relief materials, as well as resettle them. Meanwhile, the National Emergency Management Agency (NEMA) has paid a condolence visit to Kebbi State over the huge losses suffered from the flood that ravaged 18 communities in the last two weeks.Its Director General, Engr. Mustapha Maihaja, who was represented by Deputy Director, Search and Rescue Department, Dr. Onimode Bandele, said they were in the state on President Muhammadu Buhari’s orders. He added that President Buhari conveyed his sympathy to the government and people of the states affected by floods, adding that the victims, who suffered material losses would be compensated.He told his audience that they visited the state to hold a stakeholders meeting, collate data on extent of damage and assist the affected areas. Bandele explained that the visit would enable the Federal Government to adequately provide palliatives to the victims through NEMA.